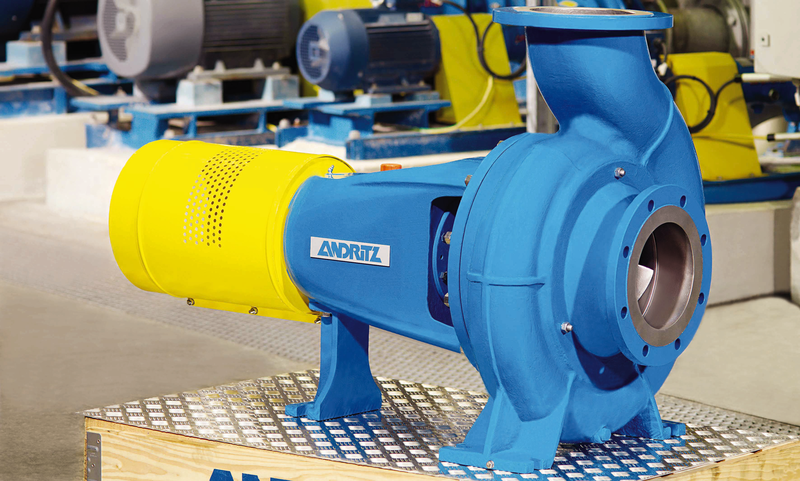 ANDRITZ single-stage centrifugal pumps from the ACP are available in a highly wear-resistant, open impeller design. Thanks to their low axial thrust and open channels, these pumps are suitable for conveying many different media. Depending on the impeller design, they can convey slightly contaminated and contaminated media with some solids and content with consistencies of up to 8%. Equipped with our innovative SMARTSEP degassing system an additional separation impeller acts as an integrated degassing system and removes gas from the media and conveys fibers reliably back to the pump at the same time. Thus, operating as processes pumps, they cover a wide range of applications in the pulp and paper, mining, offshore, power, food, and chemical industry. Additionally, ANDRITZ single-stage centrifugal pumps can also be used in water supply, waste water treatment, desalination plants, and irrigation as well as drainage. A modular system ensures high availability, enables the use of proven components and reduces the number of spare parts to be held in stock. ANDRITZ centrifugal pumps from the ACP series can be delivered with an Industrial Internet of Things integrated base. For more information on our single-stage centrifugal pumps from the ACP series please have a look at our brochures in the sidebar or contact us directly. ANDRITZ SMARTSEP has been specially designed for high gas content and stock suspensions of up to 8%. An additional separation impeller acting as an integrated degassing system removes gas from the media and conveys fibers reliably back to the pump at the same time. Thus, no additional vacuum pump is needed. The controlling of the degassing valve becomes very easy. When the pump is running the valve is open, but when the pump is not running the valve is closed. Being the predecessor to the ACP series, ANDRITZ centrifugal pumps, S series, are operating successfully all over the world. They offer robustness and wear resistance and thus fulfill high customer expectations in terms of efficiency, life cycle, maintenance friendliness ​​​​​​​and economic efficiency. They are ideal process pumps for the pulp production, recycled fiber preparation or papermaking as well as in the chemical, food or energy industry and for water supply and waste water treatment. For more information on our single-stage centrifugal pumps from the S series please contact us directly. ANDRITZ single-stage centrifugal pumps from the ISO series are characterized by their low energy consumption and easy maintenance thanks to their modular design. Available with a closed impeller, these pumps have been designed to convey clean, slightly contaminated, and aggressive liquids up to 1 percent bone dry. Thus, these pumps can be installed for process water supply in the pulp and paper, steel, food, sugar, chemical ​​​​​​​and power industry. They also serve in the area of drinking water supply, waste water treatment, and production of bioethanol. For more information on our single-stage centrifugal pumps from the ISO series please contact us directly. ANDRITZ non-self-priming volute casing centrifugal pumps from the ES04 series are extremely compact units which require very little space. They are particularly suitable for all those applications where space is at a premium, i.e. in crate and bottle washing machines, in air conditioning, refrigeration and heating systems, in surface finishing, dust collection, water treatment, water supply and irrigation plant, also in industrial washing machines. The pumps are designed to handle clean or slightly contaminated media over a temperature range from -20 to +140°C. Even corrosive media can be handled provided pump materials and mechanical seals have been selected accordingly. A special vortex or two-channel impeller is available for certain pump models. For more information on our single-stage centrifugal pumps from the ES series please contact us directly.